They might be a state away, but gun shows in Nevada result in an uptick in gun-related deaths and injuries across some California communities, according to a new study crafted by University of California, Berkeley researchers. Kris Sanchez reports. They might be a state away, but gun shows in Nevada result in an uptick in gun-related deaths and injuries across some California communities, according to a new study crafted by University of California, Berkeley researchers. The study found that for at least two weeks after a gun show in Nevada, deaths and injuries stemming from gun violence jumped nearly 70 percent in Golden State communities "within convenient driving distance" to the Silver State, according to the study. Similar jumps in gun violence did not occur after gun shows in California. 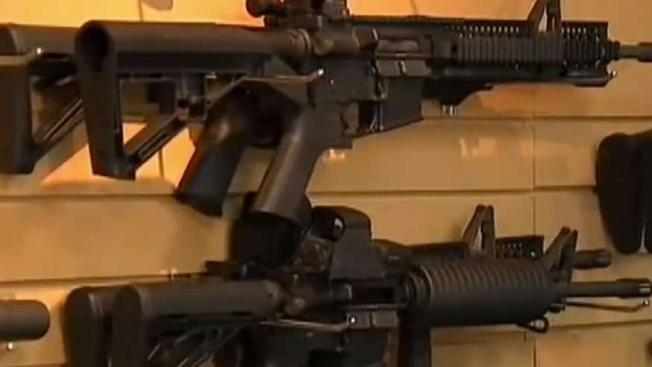 Researchers said they examined Nevada and California gun shows between 2005 and 2013. During that time, Nevada did not require background checks for gun transactions in a private setting. California did require background checks for all gun transactions. "The study suggests that travel to less-restrictive states may threaten the effectiveness of firearm laws within California," Ellicott Mattay, the study's lead author, wrote. "When a less-restrictive is next to a state that is more restrictive, there may be spillover effects. More research is needed to know for certain." Nevada residents have since voted to have background checks for private gun sales, but that law has yet to go into effect, according to the study. The study found that more than 4,000 gun shows occur across the country every year. Roughly 4 to 9 percent of annual firearms sales are linked to those shows.